THERE IS A GOOD WEIGHT TO THIS JACKET. TINY BEADED SEQUENCES THROUGHOUT THE JACKET. 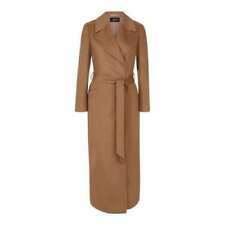 This is a beautiful coat by Jaeger. Size 18 it is edge to edge with one button and a belt to fasten. It is 60% wool 40% polyester and has a lovely feel to it. It has two pockets to the front and a collar. Labelled as a size 18 the measurements are 48" bust, length from collar to hem is 44" and there is a vent in the back for ease of walking. 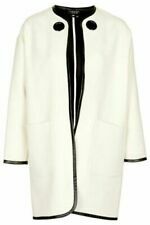 Exquisite black Jaegar cropped jacket - 16. This wool-mix smart cropped jacket is ideal for weddings and office wear. Current season cropped jackets are £150 , so you can get yourself a quality piece of clothing here for a fraction of the price. Jaeger Navy Jacket Wool Blend fully lined. Outer- 52% Polyester 43% Virgin Wool 5% Elastane. Inner- 96% Acetate 5% Elastane. Size: UK 12. Zip fastening with detachable belt. Good quality soft jacket by Jaeger. 87% virgin wool content. In good, clean, wearable condition. Jaeger navy jacket. Large cowl neck collar. Outer: 46% cotton 44% virgin wool 10% polyamide. 4 large button fastening. Lining: 100% viscose. The jacket is in lovely condition, photo's are of the actual jacket for sale. 80% Wool, 20% Polyester. I will send a combine invoice. Wool blend coat. Colour Blue. High neck collar with lapels. Jaeger Ladies 10 Black Wool/Cashmere Blend Long line Coat Faux Fur Detachable Collar This item has hardly been worn and is in very good Condition Fully lined, pockets and a kick split to the bottom of the back of the coat. From a smoke and pet free home Postage is by second class signed for.Usually 2 day despatch. Any questions please feel free to ask. Designed with a brown coloured wool blend material and has a button fastening. Could be worn for different occasions. Style: Trench Coats, Macs. Neckline: Collared. Material: Wool Blend. Type: Coat. GORGEOUS BLACK TAILORED JACKET BY JAEGER WITH WHITE SPOTS. 75% WOOL, 10% VISCOSE, 10% POLYAMIDE,5% ANGORA. SIZE UK 14. VERY GOOD CONDITION. RIBBON DETAILING. FULLY LINED. Jaeger Wool Coat. Wool blend (care label faded). UK Size 16 (size faded). SHELL VISCOSE WOOL COTTON POLYAMIDE. SIZE UK 14. 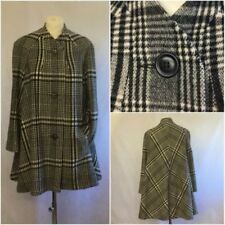 Classic Jaeger check jacket in lovely condition. 4 shiny black buttons on front to fasten and 1 on cuffs. • Size UK14. • 56% polyamide 44% wool. • Great condition. • Pit to pit 21". Stunning black wool blend jacket with detachable collar. Size is 8, but it’s quite loose. I’d say it will be good for M, unless you like loose fit. Measurements: Armpit to armpit :approx 19in Length: approx 20.5in Ask me questions if you have. 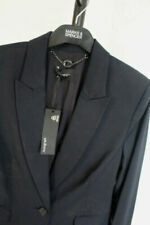 JAEGER Navy Wool Blend Jacket Size 10. Used in excellent condition. % 60 acrylic, %20 wool, % 15 polyester. %100 acetate trim full details show on photos. Please check my other items. Thank you for looking. Neat Jaegar Wool Blend Jacket Size 14 Condition is Used. Dispatched with Royal Mail 2nd Class. Back of neck to bottom end 28". armpit to bottom end 18". armpit to armpit 21". Very flattering on, Jaeger winter coat in size 10, as per photos.